Following the trial run for team Stag Knights at the Dundee Duel, the club recently took delivery of its first full order of branded kit. 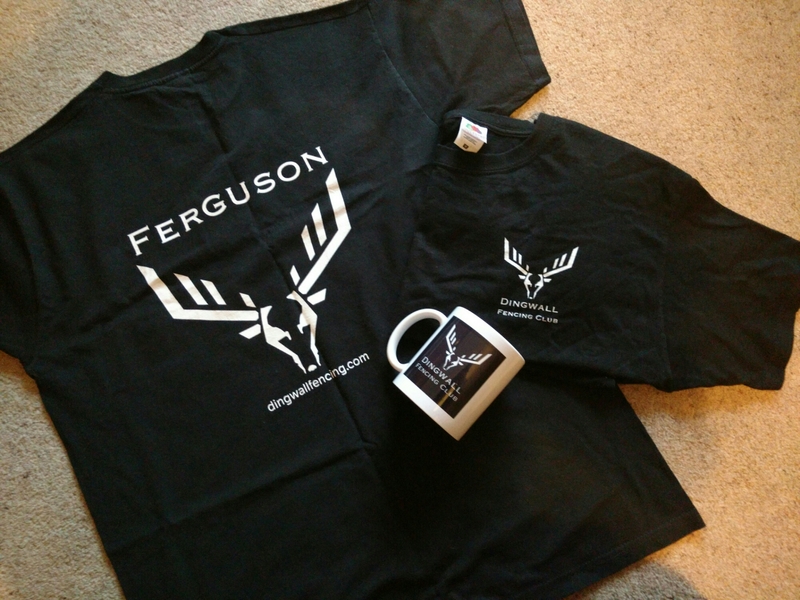 As well as a new club banner, various club members are now proud owners of a number of T-shirts and mugs. The ‘elite’ range T shirts include a large logo with your choice of name on the back as well as a smaller club logo on the left upper chest and are available in unisex adult sizes from XS to XXL. We can also do a ‘supporter’ T-shirt in white, with a large black logo on the front and no back print in both child and adult sizes. If you would like to enquire about getting your hands on some of our branded gear yourself drop us an email or speak to David at the club. Current prices are £12 for the elite T-shirts, £8 for a child’s supporter and £10 for an adult’s. Mugs are £5. Delivery charges will vary depending on how many orders we put in at once and whether you are able to collect from the club.